The 1977 unsolved homicide of Francis "Frank" J. Sidoti. 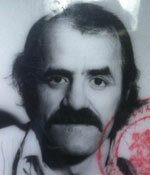 Francis "Frank" J. Sidoti, age 38, was shot to death in his home at Steel Hill in Sanbornton, NH on November 21, 1977. An autopsy revealed that Frank died of gunshot wounds to the head.